Here’s a sneak peek at one of the video projects we’ve been working on. 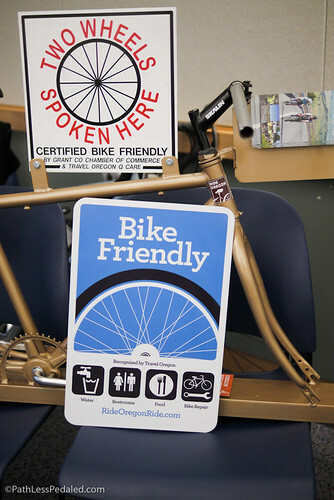 Oregon is about to launch the nation’s first state-wide bike friendly business recognition program targeted specifically towards bike travelers. This is huge! With a new study that cites that bicycling contributes $400 MILLION dollars a year (a little more than a million dollars a day), Oregon is getting serious about making it even easier for people to come to the state and recreate by bike. We’ve been tasked with interviewing businesses who are bike friendly (and have seen the economic rewards of welcoming cyclists) and creating a piece to inspire other businesses around the state. We’ve had a chance to sit down with business owners large and small, from a B&B in Salem to the VP of operations at Chris King to the head roaster at Stumptown. Although we’ve got a few solid interviews in the can, we really want to knock this video out of the park. It really is becoming a passion project. So if you’re a business in Oregon (specifically a lodging property, restaurant or retail) that is bike friendly, contact us for a possible interview! We’d very much like to be included, as we are in the hospitality industry in the Camp Sherman area of Central Oregon, a biking Mecca! This encourages people to “drink and ride”, which seems like a very bad idea. Coffee, tea, soda are all good, but not alcohol when you have to ride home! Lets face it, how many are going to arrive on a tandem with a designated rider? I think that you have a very valid point. I also think that people drive cars to bars and then drink and drive. I don’t think that anyone is encouraging drinking and riding anymore than a bar with a parking lot full of cars is encouraging drinking and driving. I know that when I go out I don’t go out to get intoxicated. I go out to have a good time and drink a couple of beers. I think that most people who frequent this establishment enjoy the same. I’m VERY happy to see this post and this video. I’m not from Oregon, but am looking forward to hearing about more bike-friendly business that can serve as models for other places! I too feel that promoting drinking and riding is probably not the best idea. Here in Ohio you can get a DUI charge on a bicycle the same as you can for driving or even having “physical control” (keys in your possession). If you are intoxicated and pushing your bicycle you could still get a DUI charge because you have “physical control” and bicycles are classified as VEHICLES ! Jessie, Ever considered Bike art? Any chance of parking on a wall? Would love to see the coolest bikes displayed while having a few. Plus it looks like you need a few more spaces. I’m the hell in Texas so its probably all over Portland but if not then maybe?